The swag has been a part of Australia’s identity for as long as our great country has existed. The image of “swagmen” rings out a symbol of liberty and discovery – two of the characteristics that make Australia so great. For decades the “swagmen” were used as subjects by painters, illustrators, musicians and other artists. Their swag was a symbol of freedom and represented the fact the world around them was their home. The swag has been used ever since by adventurers, hikers and campers and in recent years the dome swag has emerged as the next great iteration on this symbolic piece of equipment. But what makes this development so interesting and why should you consider purchasing a dome swag from Southern Cross Canvas Products? Our focus is on customer satisfaction above all else. This is why we strive for perfection with our products and do extensive testing throughout the design phase to make sure that what we create works. Our Designers & Staff have decades of experience and this helps us to make constant tweaks and improvements that make the swag experience as comfortable as possible. Do you like to go out alone on your adventures or do you work as part of a team? Whatever your preference you can rest assured that there is a dome swag out there for you. 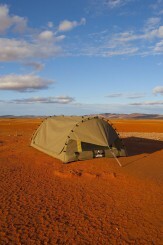 Our dome swags are spacious and their roominess is further accentuated by the dome itself. 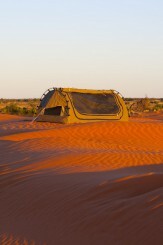 This means that one, two or more people can sleep in our range of dome swags without a canvas having any contact with them from above. We offer single, double and king sizes. 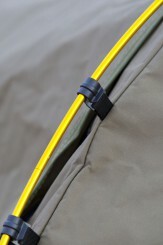 This flexibility in terms of sizes is what makes so many of our customers love our dome swags. We are confident that the moment you try one of them for yourself – alone or with other people – you will understand the attraction. We never compromise on the quality of the materials that we use. We work exclusively with Australian canvas so that we understand where our materials are sourced from and what level of quality they offer. Of course, a good raw material is only as useful as the hands that put it together. Our team has decades of experience working with this high-quality material. Our designers and testers always trial new products to ensure that they function as expected and get the most from the materials. 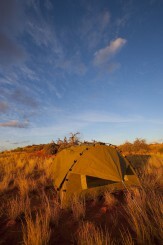 This is why our dome swags are so effective at working so well in Australia’s very specific and distinct environment. If you are searching for a dome swag for sale, then don’t hesitate to get in touch with us today. You and your travelling companion will be happy for it! You can find detailed product descriptions on our website and give us a call if there is a custom option that you would like to discuss with us. 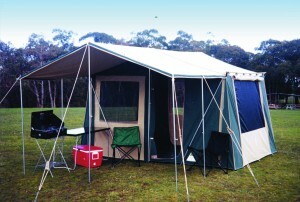 Southern Cross Canvas also offers high quality Swags, Canvas Tents, UTE Camping Canopies, Cabin Tents, Camper Trailer Tents, Canvas Annex, Caravan Annex & many more Australian made canvas products at best prices. You can get in touch with us today by giving us a call or sending a message through our website. We’ll get straight back to you. 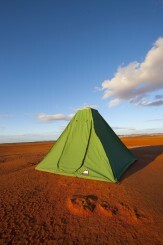 The King Dome Swag is the largest in the Dome Style Swag that Southern Cross Canvas manufacture consisting of the following dimensions: Length – 2440 mm Width – 1560 mm Height – 900 mm Rolled Diameter – 300 mm – 350 mm Canvas – Australian Made Wax Converters Dynaproofed Billabong 10.9 oz (370g/sq.m ) Canvas Base – Heavy Duty Vinyl 520 gsm Optional sizes, colours, embroidery available. Contact one of the friendly team directly for further details. Replacement bow for the King Dome Swag. Foot bow is high quality American made bows which are made from high strength, aerospace 7075-T9 alloy. Which have a scratch-resistant hard anodised surface. 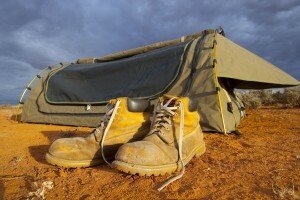 The Single Dome Swag is the smallest in the Dome Style Swag that Southern Cross Canvas manufacture consisting of the following dimensions: Length – 2130 mm Width – 900 mm Height – 700 mm Rolled Diameter – 250 mm – 300 mm Canvas – Australian Made Wax Converters Dynaproofed Billabong 10.9 oz (370g/sq.m ) Canvas Base – Heavy Duty Vinyl 520 gsm Optional sizes, colours, embroidery available. Contact one of the friendly team directly for further details. Replacement bow for the Single Dome Swag. Foot bow is high quality American made bows which are made from high strength, aerospace 7075-T9 alloy. Which have a scratch-resistant hard anodised surface.